The Papio-Missouri River Natural Resources District will receive $6.7 million from the NE Water Sustainability Fund managed by the NE Natural Resources Commission. 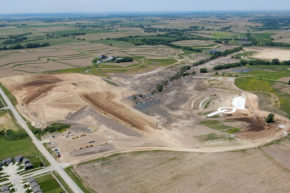 The commission approved the funding at their December meeting for Papillion Creek Watershed flood prevention reservoir sites West Papio 6 and West Papio 7 in Sarpy County. “We are extremely grateful to the commission for this funding. They had many worthy projects to consider and their support for the Omaha area’s flood prevention needs is appreciated,” said John Winkler, NRD General Manager. “These two projects have a rate of return to the taxpayers of 2.31 to 1; so for every dollar spent the taxpayer will receive two dollars and thirty one cents in return on that investment,” he said. The NE Water Sustainability Fund was created by the NE Legislature to boost state financial involvement in a variety of projects to facilitate Nebraska’s critical water management needs. “First and foremost, the District will now be able to accelerate the construction of these two reservoirs (WP 6 & WP 7) and we will be able to dedicate additional resources to the preliminary design of five additional priority flood prevention reservoirs which are currently under extreme pressure from development interests,” said Winkler. “Our current floodway mapping study is showing that every reservoir constructed has a net positive improvement in the floodplain going from now into the future,” he said. The district will use the $6.7 million to complete land rights acquisition and construction for the two reservoir sites. “This Water Sustainability Fund financial assistance will further reduce pressure on property taxes,” said Winkler. Dam Site WP-6 will be built on the west side of 114th Street, north of Cornhusker Rd. The site will be managed for recreation by the City of Papillion. The lake created by WP-6 will be approximately 34 acres of water surrounded by an additional 69 acres of public parkland. WP-7 will be built on the east side of 108th Street, south of Cornhusker Road. This project will also be managed for recreation by the City of Papillion. The lake created by WP-7 will be approximately 13 acres of water surrounded by an additional 32 acres of public parkland. Both reservoirs will enhance flood protection for property and public infrastructure downstream along the West Papio Creek, adding flood protection to residents of the Cities of Papillion and Bellevue. The projects are in cooperation with the Papillion Creek Watershed Partnership consisting of the NRD, Sarpy County and the Cities of Omaha, Papillion, Bellevue, LaVista, Gretna, Ralston, and Boys Town. The Partnership seeks workable solutions to address flood prevention along with stream and lake water quality that will enhance the quality of life for metro area’s residents. The chemical rotenone has been applied at Wehrspann Lake by the NE Game and Parks Commission in order to remove gizzard shad. Wehrspann is managed by the Papio-Missouri River NRD and the district relies on the NE Game and Parks Commission to manage the fishery. Gizzard shad are susceptible to a low dose of rotenone while fish such as largemouth bass, bluegill, channel catfish and crappie are less affected. Low dosages of rotenone are done at low water temperatures to increase its effectiveness on shad and lower impacts on nontarget species. Rotenone, derived from the roots of plants that grow in South America, inhibits the uptake of oxygen at the cellular level. It only affects gill-breathing organisms. Next spring, additional 4-inch largemouth bass will be stocked in Wehrspann. Pigeon Creek Dredging in Dakota County. The Papio-Missouri River Natural Resources District has begun a project to reduce the sediment buildup in Pigeon Creek in Dakota County. The dredging will help lessen historical flooding of adjacent agricultural land. Approximately 7 miles of the creek will be dredged by Natural Resources District crews. This area received considerable flooding in June, 2014. The Pigeon Creek Levee was damaged twice during June due to record rainfall. “Areas of Dakota County received an unheard of 28 inches of precipitation,” said NRD General Manager, John Winkler. “Work to repair the levee was done immediately. This new dredging work will greatly improve the capacity of the levees to safely convey heavy rainfall runoff,” he said. Dredging will be done from approximately Highway 77, north of Homer, upstream to the bridge at South Bluff Rd, east of Hubbard. 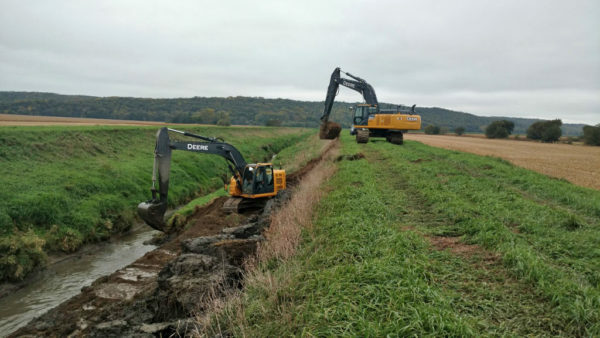 This project is part of the Elk/Pigeon Creek Improvement Project Area and will be paid for with Natural Resources District funding approved at the district’s September 9th Board of Directors meeting in Dakota City. A motion from Subdistrict 1 director Bill Rhea to add an additional $142, 322 to the FY 2017 budget for the work was approved by the Board. The total budgeted by the NRD for this project is $199,500. Dredging of the seven miles will continue through this fall and into 2017. The Papio-Missouri River NRD Board of Directors has approved its Fiscal year 2017 Long Range Implementation Plan (LRIP). “We are projecting to lower our expenditures by nearly half (45%) over the next five years,” said NRD General Manager, John Winkler. We plan to do this while simultaneously attempting to fund over 50 projects and programs which provide public safety like flood control and water quality,” he said. Approval of this LRIP follows the Board of Directors September approval of a budget that will once again require no increase in the NRD property tax levy. Each year, the NRD updates this planning document that summarizes planned District activities and includes projections of financial, personnel, and land rights needs of the District for at least the next five years. Constant maintenance and operation of Papillion Creek, Missouri River and Platte River levees. 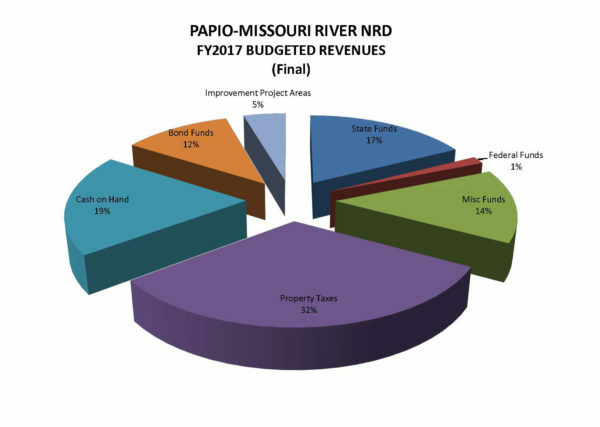 At its September 8th Board of Directors meeting the Papio-Missouri River Natural Resources District Board of Directors held a public hearing on its FY 2017 General Operating Budget and then voted to approve a budget that will require no increase in the NRD property tax levy. The proposed budget calls for a Fiscal Year 2017 property tax levy of .038034, the same as in FY 2016. The levy would mean that the owner of property valued at $100,000 would pay a total of $38.03 in property taxes next year to support NRD projects. “With our property taxpayers in mind, we continue to hold the line on tax levy increases. This is the 11th year out of the past twelve that the NRD has decreased or held steady its tax levy,” said NRD General Manager, John Winkler. The levy is based on an estimated 3.88 percent increase in valuations across the district. The Papio-Missouri River NRD area includes all of Sarpy, Douglas, Washington and Dakota Counties plus the eastern 60% of Burt and Thurston Counties. The NRD’s property tax levy amounts to less than two percent of the total property tax bill for residents living within the District’s six-county area. “This NRD serves more residents than any other government body, with the only exception being the State of Nebraska,” said Winkler.